Reputation is power. Your reputation defines how people see you and what they will do for you. It determines whether your bank will lend you money to buy a house or car; whether your landlord will accept you as a tenant; which employers will hire you and how much they will pay you. It can even affect your marriage prospects. And in the coming Reputation Economy, it’s getting more powerful than ever. Because today, thanks to rapid advances in digital technology, anyone access huge troves of information about you—your buying habits, your finances, your professional and personal networks, and even your physical whereabouts—at any time. In a world where technology allows companies and individuals alike to not only gather all this data but also aggregate it and analyze it with frightening speed, accuracy, and sophistication, our digital reputations are fast becoming our most valuable currency. Here, Michael Fertik, CEO of Reputation.com and one of Silicon Valley’s leading futurists will draw on the insider tools, insights, research, and secrets that has make Reputation.com the leading reputation management firm, to show how to capitalize on the trends the Reputation Economy will trigger to improve your professional, financial, and even social prospects. You will learn: • What keywords to put in your resume, performance review, and LinkedIn profile to come up at the top of potential employers' search results.• How to curate your on and offline activity in way that will reduce the premiums calculated by insurers, lenders, and investors.• Tricks that will get you express or VIP treatment at banks, hotels, and other exclusive special offers.• Ways to improve your review or rating on sharing or peer review sites like Yelp or Angie’s List, or your standing—as buyer or seller—on sharing economy sites like AirBnB or Uber.• How to create false tails and digital smokescreens to hide the negative information that's out there. With a good digital footprint, the world is your oyster. 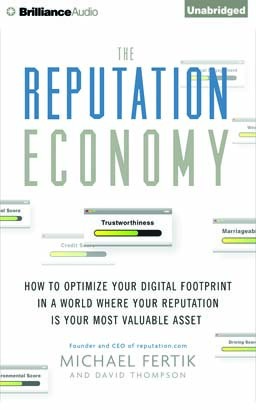 This audiobook will show you how to control, curate, and optimize your digital reputation to become “rich” in a world where your reputation is as valuable as the cash in your wallet.